We are also recommended by Solutions inc. The Apple Authorised Repair/Service Provider Centre in Bournemouth, for out-of-warranty Apple repairs. We are a minute walk from their store. We work with the Bournemouth University IT Departments to repair their iPhones, iPads and Apple Macs, that the University staff use. We offer free collection of your computer. We offer a free laptop loan. 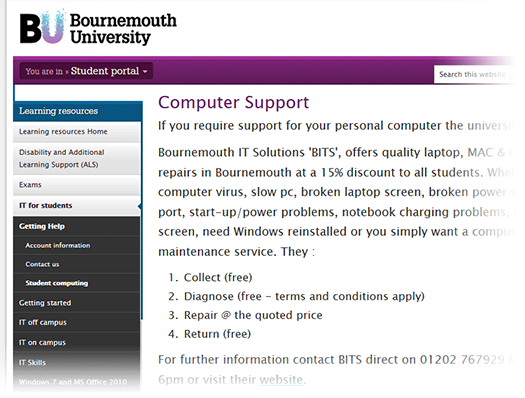 To ensure that students and staff are not without a laptop/MacBook during the repair period. Students are able to continue working without interrupting their studies. Our repairs fall within pricing bands. This ensures that labour costs are agreed before the repair is undertaken. 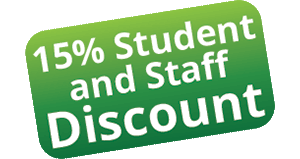 We are pleased to offer all students and staff of Bournemouth University ‘BU’, Arts University Bournemouth ‘AUB’ & Bournemouth and Poole College ‘BPC’ a 15% discount on labour charges. We are proud of our record of customer service and satisfaction. Our customers’ feedback page is our testimony, where many students and staff have commended our service. Absolutely delighted with the service and the results from bits! Will be certain to pass on the word and use them again! Thankyou very much! Quick and reliable service. They replaced my pc screen and it works perfectly now. Courtesy was remarkable: they even gave me a treat (Toblerone) when they gave me back my laptop! Excellent service! Did exactly what promised and even more: Collected – diagnosed – repaired – returned – very polite – very helpful - quicker than I expected + offered me complimentary chocolate! Huge thank you! fixed one off price, quick and professional service, would definately use again! Had a problem with my laptop and it was fixed within two days, great service and quick repair, good job all round.